By definition, capsule hotels offer a private space in a shared room, like a hostel dorm, but in the case of ASH, every effort is made to give that space a feeling of luxury and privacy. 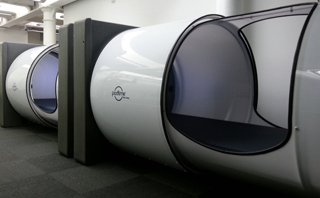 Each capsule is sound-proof and has private ventilation. The space has a locker and the showers are shared hostel-style. If you haven’t used one in a while, hostels are no longer just church basements that become available after an AA meeting is over. Comfort, cleanliness, low prices and hostel traveling’s proclivity for instigating friendships on the road, are all intact. The ASH also offers the more traditional sleeping arrangement of bunk beds as well as a lobby space, a communal kitchen, a garden and a laundromat. ASH describes its pricing as a “democratic rate,” revealing a rare and refreshing definition of democracy as also having an economic dimension. The Antwerp Student Hostel, which grand opens on Oct. 9, was developed by “Today for Tomorrow,” a Belgian real estate developer that specializes in what it calls “innovative student accommodation with cutting edge architecture.” The ASH has 63 rooms and 48 hostel beds. Beds can be booked per night or for long duration stays. During its Antwerp soft launch, the ASH hosted volunteers of the European Special Olympics, which was hosted by Belgium this year. 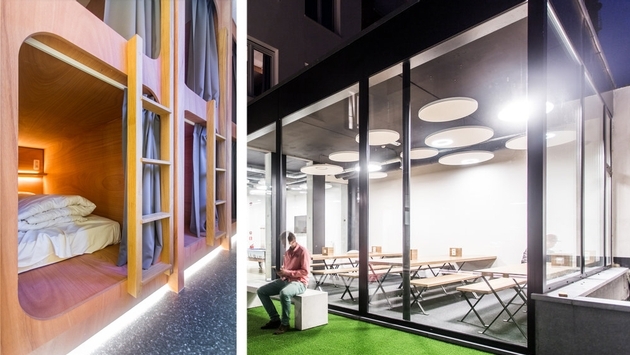 PodTime, a British developer, furnished Moscow’s Anti-Hostel Cosmic with 3 feet by 7 feet pods that come with a bed, multiple electric outlets, ample ventilation and LED lighting as well as a large luggage locker (pictured at left). These pods can be put indoors, there also outdoor versions and in a town like Moscow, known for some of Europe’s highest hotel rates, you can stay at the Anti-Hostel Cosmic for about $38 per night. Outside Narita Airport’s Terminal 2, you can get a capsule room for at the nine hours hotel priced at $38 for nine hours or for $15 per hour. According to ASH the idea is only going to grow.